On October 9, 2017, the Texas Department of Transportation’s (TxDOT) Transportation Planning and Programming (TPP) team was awarded the Gold Level Winner for the 2017 Journey Toward Excellence (JTE) Award. JTE Awards recognize TxDOT employees and teams who demonstrate leadership and commitment to improving services, products, and processes and obtaining tangible results. Recipients must demonstrate results in a wide variety of areas including customer service, process improvements and financial savings. 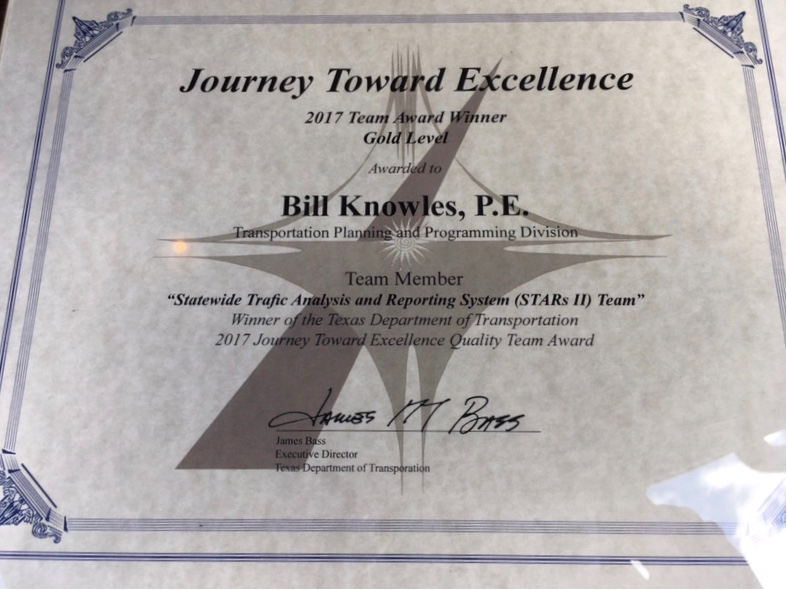 The Statewide Traffic Analysis and Reporting System (STARS II) Team faced the challenge of bringing traffic data into the 21st century while simultaneously continuing to support customer needs and to process, manage and safeguard the statewide traffic data asset. TPP has an obligation to use, make available, and preserve collected traffic data. STARS II was developed by MS2 in 2014 and replaced the legacy mainframe and PC programs along with manual processes to provide TxDOT with its first successful, cloud-based, information technology (IT) system. Though the Team envisioned a TxDOT-hosted software solution, MS2 offered a cloud-hosted solution, which, after securing a waiver from the Department of Information Resources, resulted in an 11.8% cost savings for the approximately $2 million project. With the cloud-based system, TxDOT traffic data is not only stored in a secure, accessible environment, but also TxDOT still owns the data thus preserving it for the future. The process of data migration was key to the initiation of STARS II. A decade worth of data was loaded for trend analyses and primed the system for statewide annual collection and processing of more than 75,000 counts, in addition to continuous count data from more than 350 locations. Loading historical data protects and preserves the $50+ million asset and ensures STARS II provides quality data and preserves the annual $5+ million asset going forward. By establishing full control over the factor groups, the process of calculating AADTs is more precise. With the elimination of manual processes, the incorporation of historical trend analyses, along with automatic data acceptability based on TxDOT business rules, delivery of traffic data will occur earlier. STARS II enables customers with a comprehensive, integrated system that supports increased data precision and the ability to effectively and efficiently find information for making data driven decisions for Delivering the Right Projects, Optimizing System Performance, Preserving our Assets, and Promoting Safety. Among the mission-critical successes are improved data quality, increased levels of detail, auditability, geospatial visualization, direct access, and improved reporting cycles to the Federal Highway Administration (FHWA) of statewide traffic data. All of this is possible without requiring users to install software on their own computers. STARS II can be accessed at http://txdot.ms2soft.com/tcds. By leveraging advanced technologies to meet enterprise initiatives STARS II has created a paradigm shift by providing increased data accuracy and precision that is both auditable and defensible to meet FHWA requirements. TxDOT Districts/Divisions and MPOs use traffic data for a wide variety of purposes including planning, pavement and structural design of highway and bridge systems, development and selection of transportation and maintenance projects, Travel Demand Models (TDMs), selection of routes, traffic management strategies, designation of truck routes, air quality and noise analyses, funding distributions, posting of bridges, freight movement trends, railroad crossing upgrade prioritizations, and safety. Knowles said, “During regular meetings with State Transportation Partners, it became clear that the most beneficial STARS II feature is the Proposed Site Location Tool. This feature allows input of new traffic data collection sites directly in a geospatial interface without the need for paper maps or having to e-mail a data file. Chart courtesy of TxDOT. A “site hit” is a new page load. By leveraging advanced technologies to meet enterprise initiatives, TxDOT’s STARS II has created a paradigm shift by providing increased data accuracy and precision that is both auditable and defensible to meet FHWA requirements. The benefit of increased data quality confidence is anticipated as we continue to deliver on our commitment to transparency.